“Being in a place like that, I didn’t feel like we was human.” In July of 1963, a group of African American protesters were arrested during a series of non-violent, anti-segregation demonstrations in Americus, Georgia. More than a dozen girls, some as young as 12, were taken to the county jail before being transferred almost 30 miles away to the Lee County Stockade — a small cement building being used as a makeshift jail. And although the girls were never formally charged with a crime, they’d stay there for nearly two months without their parents’ knowledge. One guard watched over them in this run-down structure with barred windows, a broken toilet, and very little food. The girls were released after nearly two months when Student Nonviolent Coordinating Committee (SNCC) discovered their location and sent a photographer, who published photos of the living conditions at the stockade. 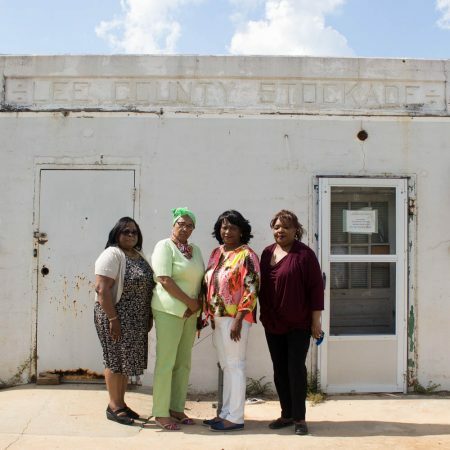 More than fifty years later, a few of the Leesburg girls, now women in their sixties, sat down for StoryCorps to shine a light on this overlooked moment in civil rights history. Also Verna Hollis, who was pregnant while imprisoned at the stockade, sat down for StoryCorps with her now-adult son, Joseph Jones III. Produced by StoryCorps. Originally aired January 18, 2019, on NPR’s Morning Edition.